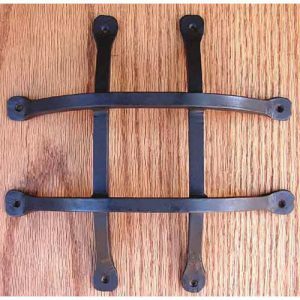 Harken back to the days of smoky speakeasy saloons, prohibition and Al Capone by adding a Speakeasy Grille or Grate to your front door or garden gate. These nostalgic pieces of history help assure your personal safety in classic style. They are offered in several styles from primitive to ornate. Bring classic charm to a door or gate with the Ornate Speakeasy Grille from Agave Ironworks. Hand forged and finished in a durable Black Powder Coat finish, this scroll design speakeasy grille is a beautifully rendered piece of art. 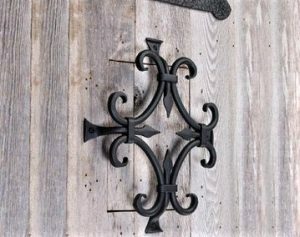 Pair this iron grille with our Hinge and Latch Set for a unique and functional addition to your entry! Available in many styles from classic cross-crossing bars to units with functioning doors and peep holes, speakeasy grilles and grates are available at Van Dyke’s Restorers. The grilles are easy to install and are a great weekend project for any DIYer. 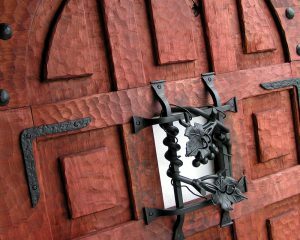 If your door does not have a window or opening, you will need to cut an opening. 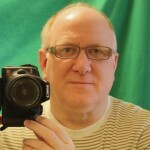 1 – Find center of door at eye level. 2 – Trace the pattern on the door for the particular unit you purchased. Use a level to make sure it is straight. 3 – Drill pilot holes in the corners of area to cut out and then cut the window out using a jig saw or similar saw. Sand smooth. 4 – Screw the grate(s) on the outside using supplied screws and the hinged door on the inside. 5 – For grate style speakeasies, mark the holes for each grate (bar) and drill pilot holes. 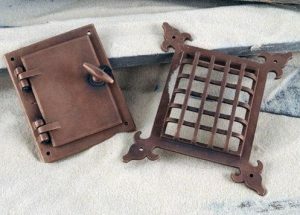 Place the grates in place and screw securely using supplied screws. 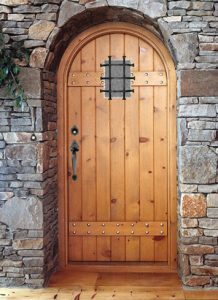 Add an iron handle, clavos nails and strap hinges for a period look. Here are some photographs of completed speakeasies.